The disabling effects of being vegan. How Blackpool might be improved by drilling a hole through it. A perfect location for rebuilding Palmyra. Why Tom Cruise can worship lizards if he wants to. It's all been a bit unsettling. But don't worry. If You'd Just Let Me Finish is Clarkson at his best. He may be as bemused, exasperated, amused and surprised as the rest of us, but in a world gone crazy, thank God someone has still got his head screwed on . . .
Jeremy Charles Robert Clarkson (born April 11, 1960) is an English broadcaster and writer who specialises in motoring. He writes weekly columns for The Sunday Times and The Sun, but is better known for his role on the BBC television program Top Gear. From a career as a local journalist in the north of England, he rose to public prominence as a presenter of the original format of Top Gear in 1988. Since the mid-1990s Clarkson has become a recognised public personality, regularly appearing on British television presenting his own shows and appearing as a guest on other shows. 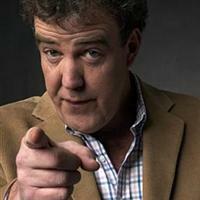 As well as motoring, Clarkson has produced programmes and books on subjects such as history and engineering. From 1998 to 2000 he also hosted his own chat show, Clarkson. His opinionated but humorous tongue-in-cheek writing and presenting style has often generated much public reaction to his viewpoints. His actions both privately and as a Top Gear presenter have also sometimes resulted in criticism from the media, politicians, pressure groups and the public. Item Added: If You'd Just Let Me Finish!